Raw, lanky frame w/ intriguing upside for the two-way game. Strong smarts & awareness. 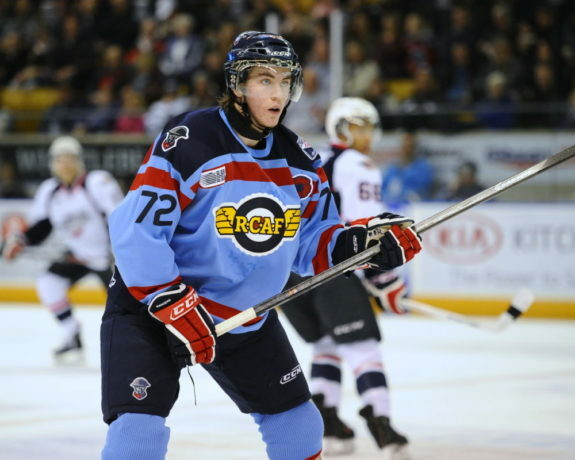 Ryan MacInnis (Kitchener Rangers, OHL) was asked if his shot rivals that of his Hockey Hall of Fame father: "Not even close"
The Tall One – A 6’4 centre, every team wants one. Genes – Son of NHL Hall of Famer, Al MacInnis. Offense – Add great hands and passing ability to a 6’4 frame and you have a solid foundation to build upon. While his shot doesn’t make the goaltenders cringe like his dear old Dad did, he does possess a very good wrist shot with a nice release. Defense – Has the makings of a strong two-way forward with size. He is not quite there yet but you can see it in his future. Future improvements to make – Ryan is not a physical player but is working to improve in this area. If he adds some weight and strength to his lanky 6’4,185 lb. frame, then, I think he will find much more success and confidence in the physical side of the game. Draft placement – Rankings are many clustered from the late first to mid second. While his results for the year have not been overwhelming, teams looking for size with skill are not going to pass over this guy for long – a solid second with a good chance of a late first.